Spend a day away from the hustle and bustle of the city and explore the beautiful towns of Sintra and Cascais. 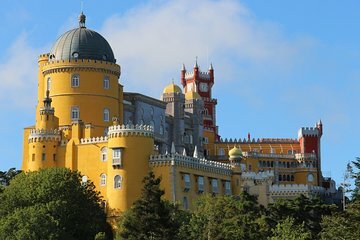 Explore the fairytale castles of Sintra and wander the UNESCO-listed town located in the mountains. Then head to the coast and soak up the sun as you explore Cabo da Roca, the westernmost point in Europe, and the seaside village of Cascais. Very enjoyable trip. We had a car to ourselves with Dino as our driver. We made stops in Sintra, Pena Palace, Quinta da Regaleira, Cabo da Roca, and Boa do Inferno on the way back. He was more than happy to wait as long as we needed and pick us up at short notice at each stop. Route was flexible, and when we had some time at the end, we asked for a quick stop at the Cristo Rei for the view over Lisbon, which Dino was happy to do. Very good value for money, especially as other trips at this price range were in a coach instead of private car.